Post-election protests in Iran, June, 2009. U.S. Vice President Joe Biden said Iran's leaders are "sowing the seeds of their own destruction". Iran recently test-fired a new rocket into space and announced major advances in its space program. The news has raised concerns in the international community because many of the technological building blocks used in space launch vehicles are the same as those required to develop long-range ballistic missiles. Iran's ballistic missile program, along with its nuclear program, has long been an issue for the United Nations Security Council. The Iranian government also announced that nine anti-government demonstrators who were sentenced to death for being "enemies of God" will soon be executed. Two political activists were hanged in late January after being convicted of the same charge in trials that did not meet Iran's own judicial standard for due process. Since Iran's disputed presidential election in June, thousands of Iranians have been arrested, over a hundred have been put on trial with no legal protection, and scores have died by government-sponsored violence. In a television interview, U.S. Vice President Joe Biden said Iran's leaders are "sowing the seeds of their own destruction" because of their repression of the Iranian people. "When they acted as they did, when the first protests broke out and people were brutalized, they lost their moral credibility in their own country and around the region," he said. Now, "the people of Iran. . .the very people marching, they're thinking about regime change." In regard to Iran's nuclear program, Mr. Biden indicated that the Obama administration's dual strategy -– of engagement and pressure -- is the correct one. "It's time [for the United States] to reach out, demonstrate that we're not the problem. . . .and be able to have the whole world stay with us. 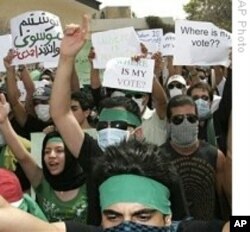 . . .against the Iranian government," he said. The U.S. and other countries, said Vice President Biden, are preparing new measures to pressure Iran: "I think that we've moved in the right direction in a measured way."